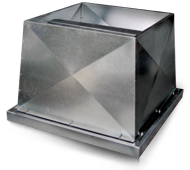 The Alpha & Beta Industrial Series of axial roof units are designed for a wide range of free intake and ducted exhaust systems. These durable and robust units feature adjustable pitch impellers which allows for optimum air flow and power efficiency. There are 6 sizes in each range extending from 500 to 1000mm diameter. Exhausting clean air and a range of toxic, noxious and corrosive gases from a wide range of commercial and industrial applications. The axial roof ventilators shall be of the RSSL vertical discharge Beta Industrial Series as designed and manufactured by Fantech Pty. Ltd. The windbands shall be constructed from galvanised steel. Impellers shall be adjustable pitch manufactured from aluminium and constructed to suit the elevated temperatures, with blades pinned as required by the manufacturer. All fans shall be tested to meet the air flow, temperature and structural requirements of AS/NZS1668.1:1998 and AS/NZS 4429:1999. Wide choice of speeds available. Adjustable pitch impellers provide a wide range of performances. Impeller blades can be GRP, aluminium, nylon or anti-static to suit the application. GRP blades are standard. Shutters are standard on the RVLE range and an optional extra on the RDLE units. (See Special Note). Can be used for free intake or ducted systems. All standard motors are speed-controllable using variable speed drives. Multi-speed motors as well as motors to meet Ex d, Ex e, Ex nA or Ex tD Standards can be supplied. For applications prone to high prevailing winds refer to Special Note.